Dress it up or dress it down, this J. Crew blouse is versatile, charming, and perfect for any weekend event. I'm thinking the jeans for museum hopping, and the skirt for dinner and the theatre. This top is too cute! You know I love stripes and it is calling my name. I feel like it would get worn a lot. You did a great job creating the two outfits--really like the skinnies with it. 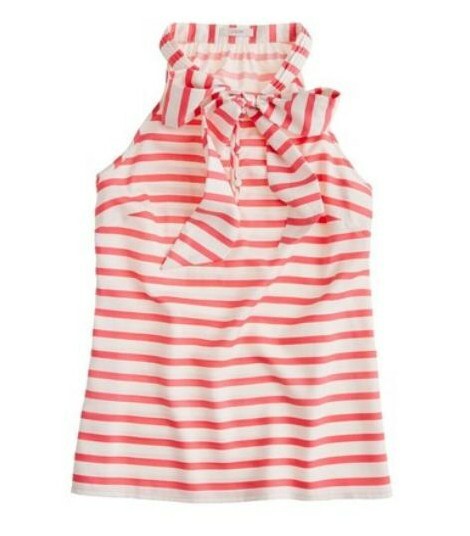 Live the top, tried it on yesterday and it looked Fabulous, but for $100.00 I'm honna have to let it stay with J Crew a little longer... This shopaholic is BROKE! lovely outfits, especially the "dress up" one!! I absolutely love that top! So many different ways to wear it!! Fantastic shirt. J. Crew does weekend so well. I love all things j crew, but the "dress up" clutch is beyond amazing. I need it now please.